Make them sit up and take notice. Our small projectors come packed with big technology. A picture paints a thousand words. Make your presentations shine with the latest in projection technology from leading brands Vivitek, Epson Hitachi. Small packages pack a big punch with new-age, pocket-sized portable projectors that integrate with smartphones, tablets or laptops. Large auditorium displays are bright and brilliant with HD 3D-ready multi-media projectors that integrate with any video source. 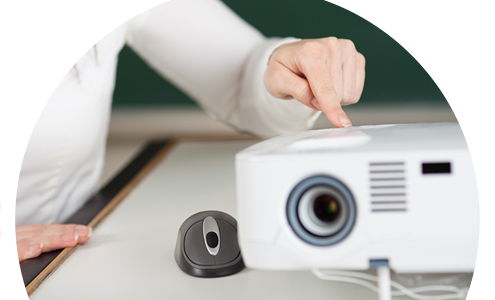 Teaching comes into the 21st century with classroom projectors that display books or documents and share lessons from any computer or iOS or Android device. Ambient light, screen positioning, room size and application are but a few things to consider in making the right choice. With a wealth of experience, Avicom is ideally positioned to advise you on a projector perfect for your needs, so contact us today and leave the lumens to us. From lightweight and portable to large room, our top-specced projectors will enhance your presentations and engage your audience. Brighter colours, better contrast and higher definition work together to make your show and tell more realistic than ever. World leader in projection technology, Vivitek’s extensive range of projectors covers everything from mobile, to home to large venue. The first pocket-sized full HD 1080p projector. Perfect for work or home. Watch movies, photos and any other content on a big screen up to 3m diagonal. BYOD-ready, instantly connect to your tablet or phone. An BYOD-compatible portable projector with 3D functionality and built-in audio. It’s ultra mobile at just 2.3kg, yet delivers brilliant 3,000 ANSI lumens and a sharp 15,000:1 contrast ratio. A compact full HD projector ideal for educational applications. MHL device compatibility allows streaming of video and audio content from mobile devices. At just 3.2kg, it’s easy to move between rooms and quick to set up. Wide screen projection for the ultimate viewing pleasure. With 3,800 ANSI lumens of brightness and a contrast ratio of 15,000:1, this model delivers crisp images and video. Make every presentation brilliant. This widescreen WUXGA multimedia projector delivers images and video of exceptional clarity and brightness. Ideal for large meeting rooms, it comes with various BYOD connectivity options. The world’s top-selling projector brand. Known for their exceptional brightness – if colour really matters, we have the Epson projector for you. The ultra short-throw design of the EB-685W enables you to project brilliantly clear images on large screens of up to 100 inches from a short distance. It’s ideal for classroom and lecture hall applications. Weighing in at just 1.7kg, the EB-1776W is the perfect portable WXGA projector solution for business. It delivers brilliant clarity, wide-screen resolution, distortion correction and high-speed Wi-Fi functionality. A desktop projector suitable for any meeting space, the EB-1980WU promises bright colour and bright whites plus handy split-screen functionality. Easily connect it to PC via USB, and to any system with HDMI and MHL. The answer to modern BYOD teaching. These short-throw, ceiling-mountable projectors integrate with smart devices wirelessly. Share and compare students’ work from multiple devices, simultaneously, with Moderator Software3. Want only one projector for use in multiple rooms? This lightweight, small yet powerful projector is easy to move and set up in seconds. HDMI, ethernet and Wi-Fi connectivity – display content from up to four devices, simultaneously. A mobile projector designed for both office and home applications. Deliver impactful presentations, watch movies in crystal high definition, look at family photos on big screens – the EB-W31 does it all. Compact, portable and affordable, the Epson EB-1940W is perfect for corporate or educational use. Crystaline image quality, sleek Japanese design – Hitachi’s range of projectors is the perfect marriage of exquisite form and superior function. Make a big impact in the smallest spaces – these models pack all the innovation of Hitachi into compact ultra-short throw projectors. Wall or table mountable, they connect to any mobile smart device, perfect for BYOD presentations. Ideal for classroom applications, this XGA projector has a 1024 x 768 resolution, 2 000:1 contrast ratio and delivers 3 200 lumens brightness. Great for displaying image sizes of 30-300 inches. A multi-purpose mid-range WXGA projector for business or education purposes. It has a 2 000:1 contrast ratio, delivers 3 000 lumens brightness and is compatible with Crestron Room View®. Ideal for medium to large venues, this WXGA projector boasts advanced networking capabilities and simple user functionality. It has a 10 000:1 contrast ratio and delivers a brilliant 7 500 lumens brightness. Designed for large venues like museums, restaurants and shops, this WUXGA laser projector is robust enough to run 24/7. It has a 20 000:1 contrast ratio and delivers 8 000 lumens for brilliantly bright images. Academic-standard projection designed for use in large classrooms, corporate boardrooms and campus auditoriums.